Believe it or not, the holiday season is right around the corner, and while we haven't exclusively begun shopping for the perfect party-worthy outfit just yet, we do have our sights on pieces that feel festive. Whether it's a red frock that we're currently dressing down with a cream turtleneck or sequin earrings that we're pairing with a chunky sweater, it's hard not to wear these showstopping pieces ahead of time. Get a jump-start and shop the holiday-ready pieces from Free People we're styling and wearing now. 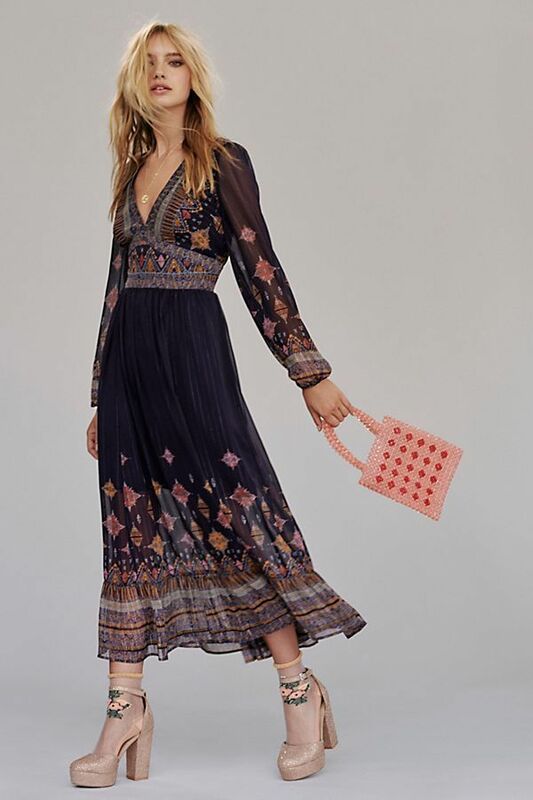 This versatile dress will be your seasonal go-to. Pair with glitter heels and a beaded bag for a holiday-ready look, or dress it down with slouchy boots. Opt for non-boring blouses this season like this sheer white number. Planning on wearing something you already own? Punch up your look and make it new with glitter boots. We love the flapper vibes of this dress, and the lilac color makes it feel fresh and new. Perfect for work and happy hour. This under-$60 mini tote is the key to taking your outfit up a notch. Stay warm and look chic. If you only buy one thing this season, make it these boots. Signet rings are an easy way to add a minimalistic touch to your look. Just add a turtleneck and boots to make this happy-hour–appropriate. These star earrings add a festive touch to a chunky knit sweater. Pair under a T-shirt or dress depending on the look you're going for. We love these earrings with both a graphic tee and a festive frock. Yes, this faux-fur coat really has hints of glitter. Style this belt over jeans or a midi dress. Pair these boots with your glitz dress for the perfect, stand-out party look. The crocodile print paired with the coloring makes this chic top-handle clutch the perfect party bag. Simple and chic, the Mini Diamante Plate necklace adds just the right amount of sparkle. Add some glitz to your ensemble with a rhinestone belt. Make your coat the statement piece of your look thanks to this leopard trench. This glittery number is your new party go-to. Turn heads with every step. Shell accessories are huge this season. Take on the trend with this pretty necklace. Up next, Here's an extensive list of the pieces I'm buying from Shopbop right now.